The Lazy Vegetarian: Do You Tofu? For the longest time, I only ate tofu at restaurants. I liked it, but I never tried to cook with it. Nowadays, I cook with tofu several times a month. It's not only healthy and delicious and cheap; it's also super easy and versatile. 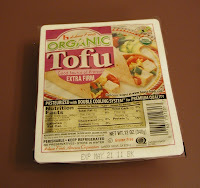 I almost always purchase extra firm organic tofu - the kind that is refrigerated. (Unless the recipe asks for silken tofu to blend.) At most regular grocery stores, you can buy this for under $2. It has 4 servings; I usually plan two meals from the package (or one big meal that leaves leftovers). First, pierce the package over the sink and let most of the water drain out. Then cut it open and take out the block. Although, if you are in a hurry, you can skip the pressing step (really), I usually go ahead and press the tofu for about 20 minutes. Sure you can buy a tofu press, but I like to just put the tofu on a plate, cover with a second plate, and place a full kettle on top! 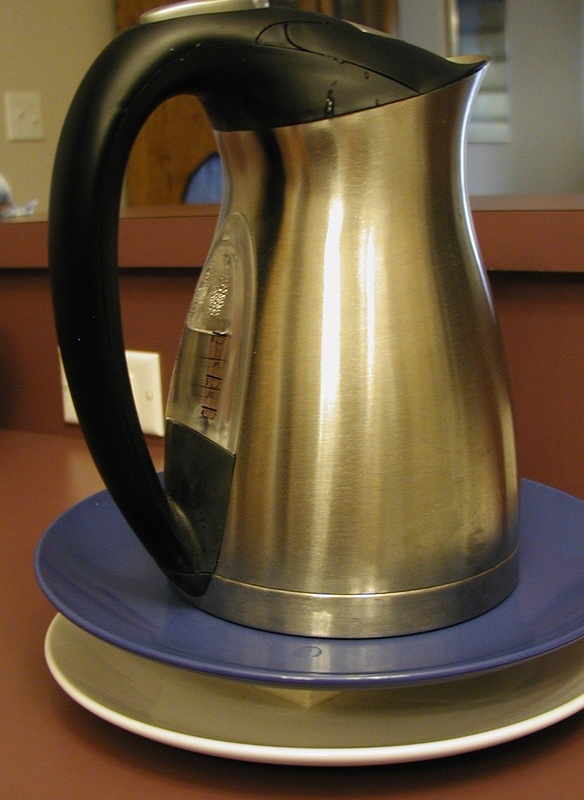 Cause, hey, the kettle is right there in the kitchen, and it's pretty heavy when full, and it fits nicely on a plate! Lazy at it's finest. When pressed, drain off the extra liquid and place on a cutting board. Then cut up the tofu for whatever recipe you are making. The day I took these photos, I was making a curry one day and stuffed poblanos later. That meant half into cubes and half crumbled to make a ricotta-type cheese replacement. 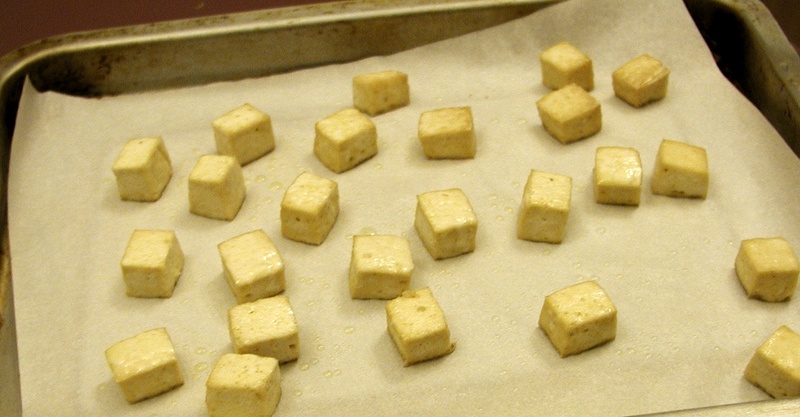 The cubes were than placed on parchment paper, sprayed with olive oil, and baked at 375 degrees for 20 minutes. 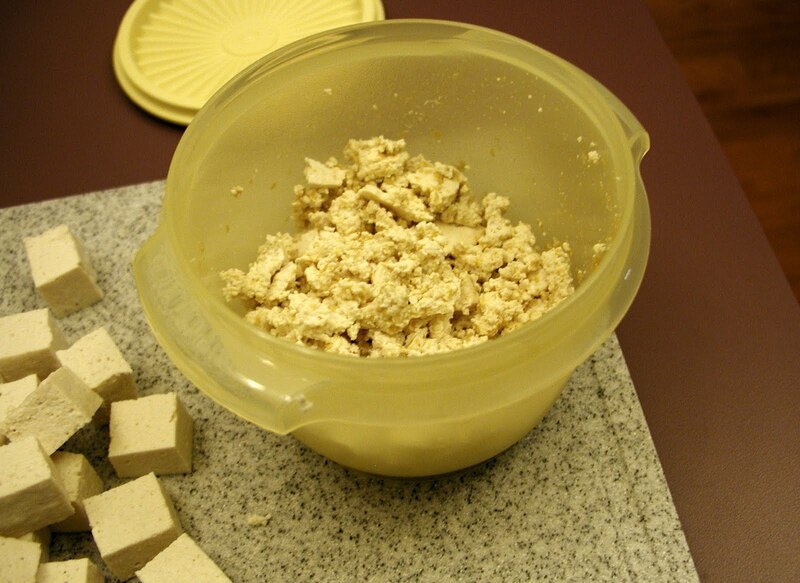 The crumbled tofu was mixed with 2 Tbsp nutritional yeast and stored in the fridge for the next day. It's that easy! I like to also bake tofu sticks with some seasonings added to use in wraps and other sandwiches (Mrs Dash lemon pepper is awesome). You can also make cutlets and bake or grill those - especially good when marinated first. Of course, you can pan-fry or deep-fry tofu (like restaurants do), but I prefer the healthier and less messy baking method. With parchment paper, clean-up is practically non-existent! And don't forget the shake and bake option. 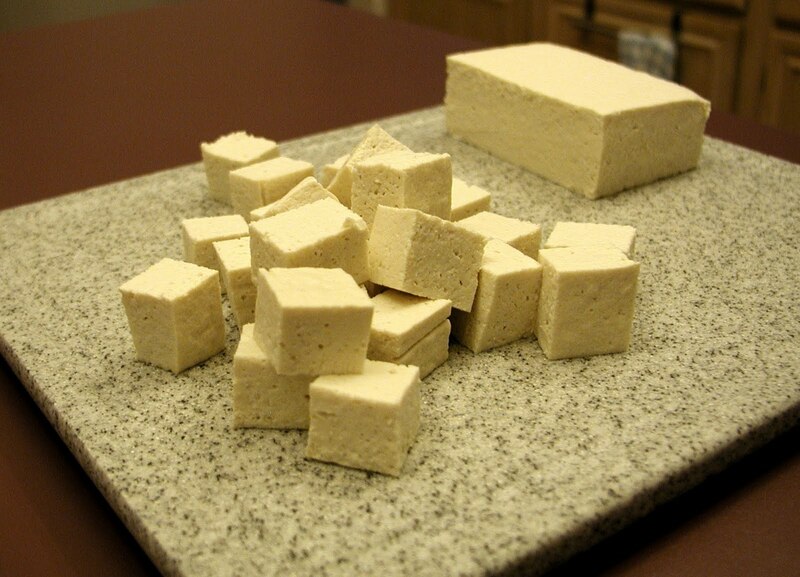 I'll be including more tofu recipes down the line, so I thought I'd share the basics here. 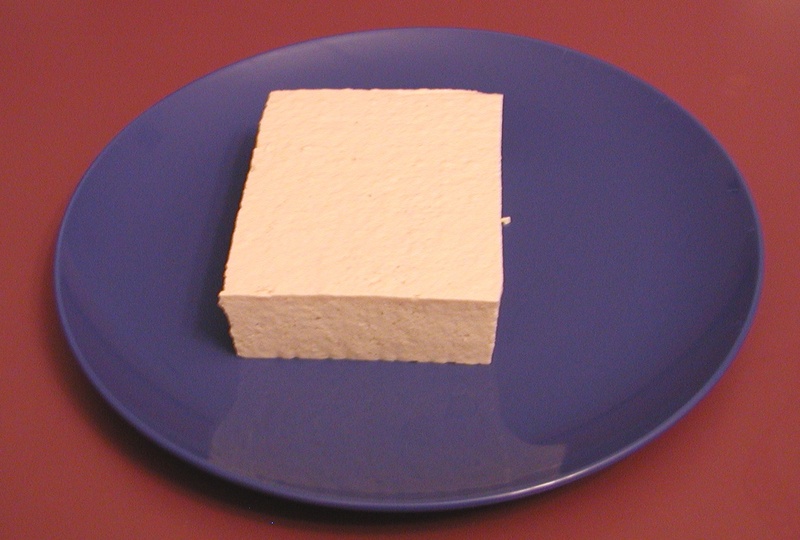 I was vegetarian for a good 8 years before I could stomach tofu. Then I had it in China and was blown away! I love the oven method and will just eat cubes cooked like that dipped in some veg worcestershire sauce + soy. Yumface! All these good vegetarian recipe has kept me alive to be vegetarian.